Budget: Three Days to Re-key Data? I just updated my Budget account profile, which only took a few moments. 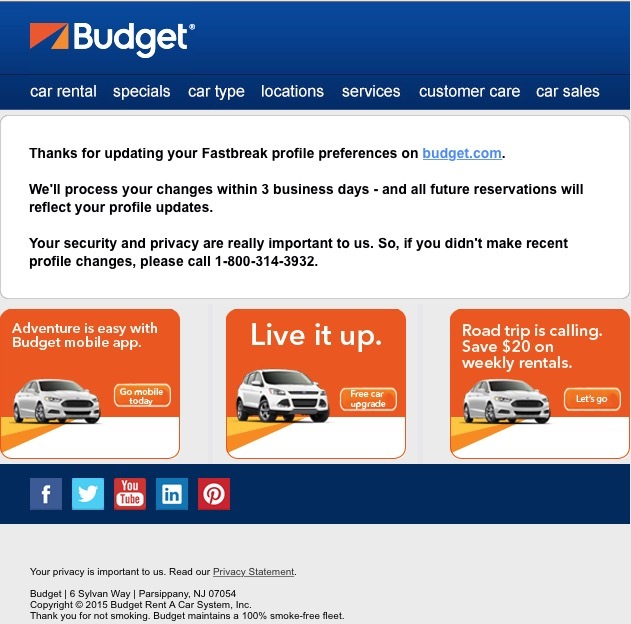 Now, according to this email, it’s going to take Budget up to another three days to update my profile with them. I have no idea what the further update entails. I guess Budget is sending my update to somebody else to re-key into some other system. I wonder what offshore low-bid vendor is getting my data. The funny thing is they took the time to automate the email to tell me about their manual process, but couldn’t be bothered to actually automate the process! I can imagine the boiler room operation they’ve cobbled together with tin cans and string to manage the verification process. And we wonder why over a billion records were stolen last year? Unnecessary data transfer and unneeded data viewing is a big part of it. This entry was posted in Customer Care and tagged Budget, CRM, email, marketing automation, PII, privacy. Bookmark the permalink.